Abraham's care for Isaac's marriage. 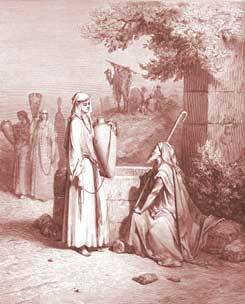 (1-9) The journey of Abraham's servant to Mesopotamia, His meeting with Rebekah. (10-28) Rebekah and her relatives consent to her marriage. (29-53) The happy meeting and marriage of Isaac and rebekah. (54-67)1-9 The effect of good example, good teaching, and the worship of God in a family, will generally appear in the piety, faithfulness, prudence, and affection of the servants. To live in such families, or to have such servants, both are blessings from God which should be highly valued, and thankfully acknowledged. But no concern in life is of greater importance to ourselves, to others, or to the church of God, than marriage. It therefore ought always to be undertaken with much care and prudence, especially with reference to the will of God, and with prayer for his direction and blessing. Where good parents are not consulted and regarded, the blessing of God cannot be expected. Parents, in disposing of their children, should carefully consult the welfare of their souls, and their furtherance in the way to heaven. Observe the charge Abraham gave to a good servant, one whose conduct, faithfulness, and affection, to him and his family, he had long known. Observe also, that Abraham remembers that God had wonderfully brought him out of the land of his birth, by the call of his grace; and therefore doubts not but He will prosper his care, not to bring his son thither again. God will cause that to end in our comfort, in which we sincerely aim at his glory. 10-28 Abraham's servant devoutly acknowledged God. We have leave to be particular in recommending our affairs to the care of Divine providence. He proposes a sign, not that he intended to proceed no further, if not gratified in it; but it is a prayer that God would provide a good wife for his young master; and that was a good prayer. She should be simple, industrious, humble, cheerful, serviceable, and hospitable. Whatever may be the fashion, common sense, as well as piety, tells us, these are the proper qualifications for a wife and mother; for one who is to be a companion to her husband, the manager of domestic concerns, and trusted to form the minds of children. When the steward came to seek a wife for his master, he did not go to places of amusement and sinful pleasure, and pray that he might meet one there, but to the well of water, expecting to find one there employed aright. He prayed that God would please to make his way in this matter plain and clear before him. Our times are in God's hand; not only events themselves, but the times of them. We must take heed of being over-bold in urging what God should do, lest the event should weaken our faith, rather than strengthen it. But God owned him by making his way clear. Rebekah, in all respects, answered the characters he sought for in the woman that was to be his master's wife. When she came to the well, she went down and filled her pitcher, and came up to go home with it. She did not stand to gaze upon the strange man his camels, but minded her business, and would not have been diverted from it but by an opportunity of doing good. She did not curiously or confidently enter into discourse with him, but answered him modestly. Being satisfied that the Lord had heard his prayer, he gave the damsel some ornaments worn in eastern countries; asking at the same time respecting her kindred. On learning that she was of his master's relations, he bowed down his head and worshipped, blessing God. His words were addressed to the Lord, but being spoken in the hearing of Rebekah, she could perceive who he was, and whence he came. 29-53 The making up of the marriage between Isaac and Rebekah is told very particularly. We are to notice God's providence in the common events of human life, and in them to exercise prudence and other graces. Laban went to ask Abraham's servant in, but not till he saw the ear-ring, and bracelet upon his sister's hands. We know Laban's character, by his conduct afterwards, and may think that he would not have been so free to entertain him, if he had not hoped to be well rewarded for it. The servant was intent upon his business. Though he was come off a journey, and come to a good house, he would not eat till he had told his errand. The doing our work, and the fulfilling our trusts, either for God or man, should be preferred by us before our food: it was our Saviour's meat and drink, #Joh 4:34|. He tells them the charge his master had given him, with the reason of it. He relates what had happened at the well, to further the proposal, plainly showing the finger of God in it. Those events which to us seem the effect of choice, contrivance, or chance, are "appointed out" of God. This hinders not, but rather encourages the use of all proper means. They freely and cheerfully close with the proposal; and any matter is likely to be comfortable, when it proceeds from the Lord. Abraham's servant thankfully acknowledges the good success he had met with. He was a humble man, and humble men are not ashamed to own their situation in life, whatever it may be. All our temporal concerns are sweet if intermixed with godliness. 54-67 Abraham's servant, as one that chose his work before his pleasure, was for hastening home. Lingering and loitering no way become a wise and good man who is faithful to his duty. As children ought not to marry without their parents' consent, so parents ought not to marry them without their own. Rebekah consented, not only to go, but to go at once. The goodness of Rebekah's character shows there was nothing wrong in her answer, though it be not agreeable to modern customs among us. We may hope that she had such an idea of the religion and godliness in the family she was to go to, as made her willing to forget her own people and her father's house. Her friends dismiss her with suitable attendants, and with hearty good wishes. They blessed Rebekah. When our relations are entering into a new condition, we ought by prayer to commend them to the blessing and grace of God. Isaac was well employed when he met Rebekah. He went out to take the advantage of a silent evening, and a solitary place, for meditation and prayer; those divine exercises by which we converse with God and our own hearts. Holy souls love retirement; it will do us good to be often alone, if rightly employed; and we are never less alone than when alone. Observe what an affectionate son Isaac was: it was about three years since his mother died, and yet he was not, till now, comforted. See also what an affectionate husband he was to his wife. Dutiful sons promise fair to be affectionate husbands; he that fills up his first station in life with honour, is likely to do the same in those that follow. It is a blessing to have faithful and Godly employees who pray to ensure the success in your vision. Verse 19~Rebekah went above and beyond and was willing to be self-sacrificing. She had fine qualities as a potential wife. Verse 63: Isaac chose to go out to a quiet place and meditate. We must create the right conditions and environment in order to meditate on the Bible properly. Verse 3: Abraham wanted to make sure his son had a wife who worshipped the same God as he worshipped and not a worldly woman. Abraham was imitating Jehovah God in what he wants for his servants. The same Faithful and Loving God of Abraham, is our God as well, when we follow in the steps of the same Faith and Love of Abraham's God. This is one of my favorite stories in the Bible, for how it shows the LORD's care and guidance in the good and natural things of this life. I also like very much, how everyone acted with respect to God's guidance: what a happy world it would be when we do also. Does anybody really read scripture anymore? In Exodus 24:10, Moses and 70 elders "saw" GOD, where did the same experience of the prophets come from - was their "vision" corrupted by their own perspectives or intentionally enhanced to suit their audience? Does anyone read past the words on the page anymore - or just reflexively quote verse without seeking the deeper meaning? Can you see beyond? I reason along with this scripture, Rebecca covered her face as soon as she was told that Isaac is the servant's master, let this be a lesson to all ladies that bed should be kept undefiled till wedding. Also,when you truly serve the Lord,people who doesn't have much faith in the Lord will believe through you, this is in case of Abraham's eldest servant. May God bless us all. Right from Abraham to his servant; there's a real show of belief in none, but the LORD alone. His committed children. The story encourages all who want to really walk with God in their Christian endeavor. What Do You Think of Genesis 24? In what place did Isaac find a wife?